Carl Lawrence said he thought he had hit a dog when his car struck father-of-five, William Corrigan. The trial was heard at Luton Crown Court. A HIT-AND-run driver who mowed down and killed a talented Irish banjo player was today jailed for 8 years. Carl Lawrence, now 39, said he thought he had hit a dog when the car he was driving fatally struck William Corrigan in the snow, throwing him onto the windscreen and onto the road. Corrigan, who was originally from Birr in Offaly, was pronounced dead at the scene in Needwood Road, Bedford at around 2.05pm on Wednesday 28 February this year. Lawrence, of Bury Court, Church Lane, Bedford, had pleaded guilty to causing the death of father-of-five Corrigan by careless driving, but he denied causing his death while unfit through drugs. He was convicted at Luton Crown Court by a majority of 11 to 1. He also admitted aggravated vehicle taking, having no licence and no insurance. 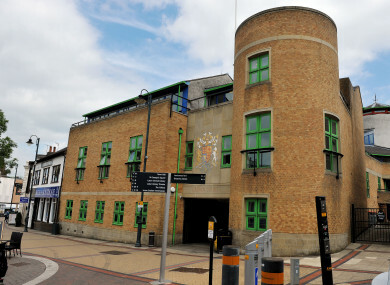 Luton crown court heard that Lawrence had tested positive for cocaine at The Path to Recovery Centre in The Crescent in Bedford, 10 minutes before the accident, but he claimed that was from taking drugs the day before. He claimed he tested positive for cocaine at the police station following his arrest because he took drugs at some point after the collision. The jury heard members of the public went to the aid of Corrigan, 38, but he was pronounced dead at the scene. Prosecutor Isabel Delamare said it had not been possible to tell if Corrigan, a father of three and step dad to two children, was on the carriageway or had walked out on the road. After hitting Corrigan, who had been walking to visit his brother-in-law, Carl Lawrence drove back to where the accident happened. Three-quarters of his windscreen had been cracked. The prosecutor said he ‘tailgated’ another car before driving into nearby Kershope Close, where he was seen to buy drugs. The car paused for a few seconds before turning back up Needswood Road, where it wheel spinned. A taxi driver followed him and took a photograph of the car and its number plate at the junction with Church Road. The taxi driver returned to the scene and gave the picture to the police. Delamare said Lawrence had been driving his former partner’s car without her permission. He was arrested at her address at 3.50pm. Is he dead? Please tell me he is not dead. Lawrence, who had 11 previous convictions for 32 offences, tested negative for alcohol, but positive for cocaine and cannabis. He former girlfriend Nicola Harrall told the jury: “He said he was driving down the road, when suddenly the windscreen came in. He looked behind and couldn’t see anything so he came home. He told me he was on his way to pick up drugs when he had the accident. After the accident, William’s widow, Susan Corrigan, 45, said: “The whole family is devastated by the loss of a loving husband, father and son. She said that William had been her “best friend”. Email “Hit-and-run driver jailed for 8 years for killing Irish banjo player”. Feedback on “Hit-and-run driver jailed for 8 years for killing Irish banjo player”.